John was the last of the four gospel writers to record the life and times of Jesus. He must have given great thought as to how he would begin his account. This one would be different from the other three. Matthew began with a genealogy going all the way back to Abraham. Mark jumped right in with grown-up-Jesus coming to be baptized. Luke started with a proper introduction and the back-story before writing a detailed account of Jesus’ birth. Luke’s family tree traced Jesus’ lineage even farther – clear back to Adam. But John wanted to start at the very beginning (a very good place to start). 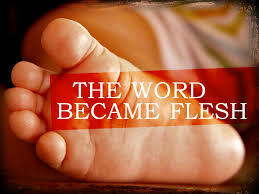 John presented Jesus not as a baby, not as a man — but as The Word. A Word with creative energy. A Word with skin on. This disciple whom Jesus loved recognized his Beloved Savior in that inaugural beginning. Before Abraham, before Adam, before time and light and molecules. who would later come and live for awhile among us. This entry was posted in Devo Drops and tagged be, beginning. Bookmark the permalink.